The Louisiana Wildlife and Fisheries Commission (LWFC) adopted notices of intent for the 2019-20 and 2020-21 hunting seasons, 2019-20 general and Wildlife Management Areas (WMA) hunting seasons and rules and regulations, 2020 general and WMA turkey hunting season and rules and regulations, and 2019-20 migratory bird hunting season and rules and regulations at its January meeting Tuesday (Jan. 8) in Baton Rouge. The notices of intent include proposed hunting season dates and regulation changes from the Louisiana Department of Wildlife and Fisheries (LDWF) for the upcoming hunting seasons and provide for a public comment period. • Ban of the use of natural deer urine as an attractant for hunting purposes. This is proposed as a cautionary measure to stop the potential importation and spread of CWD. •Language to include Louisiana lands east of the Mississippi River in East Carroll, Madison, Tensas and Concordia parishes in the state Cervid Carcass Importation ban. This will make it illegal for persons who harvest a deer on those aforementioned properties to transport a whole deer back into Louisiana. • Requirement that self-clearing permit must be utilized for all activities on WMAs. • Reducing the daily bag limit of teal from six to four for the early September teal season. • Prohibition on the use of motorized turkey decoys. • Removal of all of Pointe Coupee and West Baton Rouge parishes and parts of Avoyelles, Iberville, St. Landry and Upper St Martin parishes from Turkey Area A to Turkey Area C, which results in a reduction of 14 days of hunting opportunity. • Allowance to hunt nuisance animals and outlaw quadrupeds at night year round and the elimination of the permit needed from September-January. • Defining ‘drones’ as ‘unmanned aerial vehicles’. • Addition of airboats as an allowable vehicle on Maurepas Swamp WMA pursuant to RS:56:109.4. • Removal of ability to commercial fishing on Wonder Lake on Pointe-Aux-Chenes WMA. • Expansion of the limited access area at Joyce WMA. • Prohibition of all nighttime activities at Pointe-aux-Chenes WMA. • Change in the closing time of waterfowl hunting from noon to 2 pm at Pointe-aux-Chenes WMA, making it consistent with other WMAs. • Reduction of seven days to the turkey season at Richard K. Yancey WMA. • Reduction of the number of open turkey days from five to three at Sherburne WMA. • Closure of Tunica Hills WMA when turkey lottery hunts are taking place. 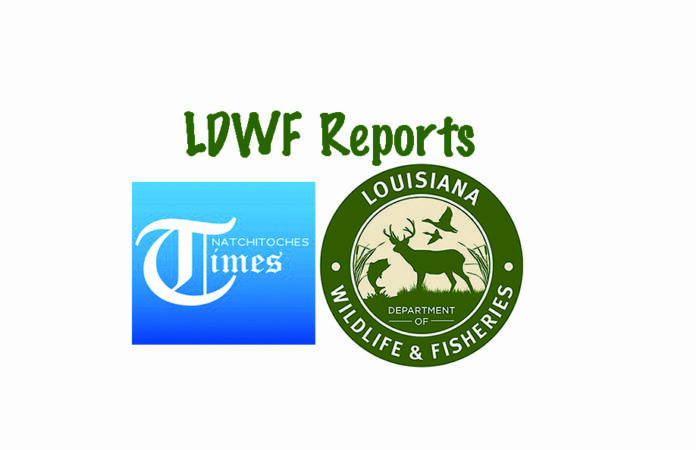 Public comment will be accepted at LWFC monthly meetings from February through March and/or can be submitted in writing by mail to: Tommy Tuma, LDWF Wildlife Division, P.O. Box 98000, Baton Rouge, LA 70898-9000, or via email to ttuma@wlf.la.gov until 9 a.m., March 7, 2019. LDWF will also collect public comment at public hearings to be held Feb. 25-March 2 throughout the state. • 25 (Monday) at 6 p.m. at the Ponchatoula High School Library, 19452 Highway 22, Ponchatoula. • 26 (Tuesday) at 6 p.m. at the LDWF Lafayette Field Office, 200 Dulles Drive, Lafayette. • 27 (Wednesday) at 6 p.m. at the LDWF Minden Field Office, 9961 Highway 80, Minden. • 28 (Thursday) at 6 p.m. at the LDWF Monroe Field Office, 368 Century Link Drive, Monroe. • March 1 (Friday) at 6 p.m. at the Alexandria Convention Hall, 915 3 rd Street, Alexandria. • March 2 (Saturday) at 10 a.m. at the LSU Ag Center Building, 7101 Gulf Highway, Lake Charles. For more information, contact Tommy Tuma at 225-765-2349 or ttuma@wlf.la.gov .